The Amphicat is a six-wheel-drive, skid steer amphibious all-terrain vehicle manufactured in the late 1960s through the early 1970s by Mobility Unlimited Inc. of Auburn Hills, Michigan. The product line was purchased by Magna American (a division of Magna Corporation) which produced the vehicle in Raymond, Mississippi for several years. The vehicle was also made in Canada by Behoo Industries and differed slightly from its American counterpart, mostly on the transom. 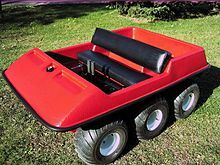 The Canadian version of the Amphicat was featured as the moon buggy used by Moonbase Alpha personnel in the television series Space: 1999 and the US version as the Banana Splits' cars in the TV show Banana Splits. It also appeared in the TV series Lancelot Link, Secret Chimp and in an episode of Blake's 7. Transmission – Ontario Drive & Gear Limited (ODG) manufactured a special transmission capable of forward and reverse for the Amphicat. ODG would use this experience to introduce their own Argo ATVs. ^ Hearst Magazines (June 1968). Popular Mechanics. Hearst Magazines. pp. 84–. ISSN 0032-4558. ^ Canadian Machinery and Metalworking. MacLean-Hunter Publishing Company. 1976.